OCD-afflicted Griffin has just lost his first love, Theo, in a drowning accident. In an attempt to hold onto every piece of the past, he forges a friendship with Theo's last boyfriend, Jackson. When Jackson begins to exhibit signs of guilt, Griffin suspects he's hiding something, and will stop at nothing to get to the truth about Theo's death. But as the grieving pair grows closer, readers will question Griffin's own version of the truth both in terms of what he's willing to hide and what true love means. Adam Silvera sure knows how to write a book that can and will rip your heart out and force your emotions to break free and run wild. History is All You Left Me is the read of the year for me. The book's ability to have you hooked till the very end is what matters most because as we know that whatever is left is history. The book's story is split from the past and the present allowing the reader to grow with the characters, feel for them, and have everything connect in the end. The main character, Griffin, going through a breakup thought that was the worst thing to happen but when disaster strikes, the one person he has to rely on for the truth is the person who, to him, stole the one person he loved. A person's history is a fickle thing to delve into but sometimes the only way to move forward is to first move backwards. Griffin is a character you can't help but love. Not saying that I don't love Jackson too but there is a growing resentment there. However, on that note, Adam has this way to write his characters to appear "real" and not just another fictional guy. The words bring the characters, the events, and the overall story to life that leave a impact on the reader. The relationship with Griffin and Jackson is where, for me, most of the story fell. However, I also thought Wade, even though he could be seen as a secondary character, was a character I had no trouble liking. The idea of one event tearing a hole in a group of friends is relevant to real life happenings that it is hard not to think back on your personal life and see how an event has ever had a toll on friendships. I know there have been some for me. 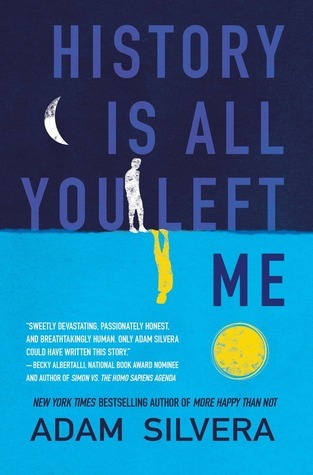 Overall, Silvera's sophomore novel is one that should not be passed. Silvera wrote a fictional story made real through the story of true love, heartbreak, and the pain of reliving history. History is All You Left Me is exactly the book to read in the upcoming year. Want the chance to meet Adam Silvera at his premiere launch of History is All You Left Me? Stop by http://www.historyisallyouleftme.com and enter for a chance to win. Do it, do it, do it! 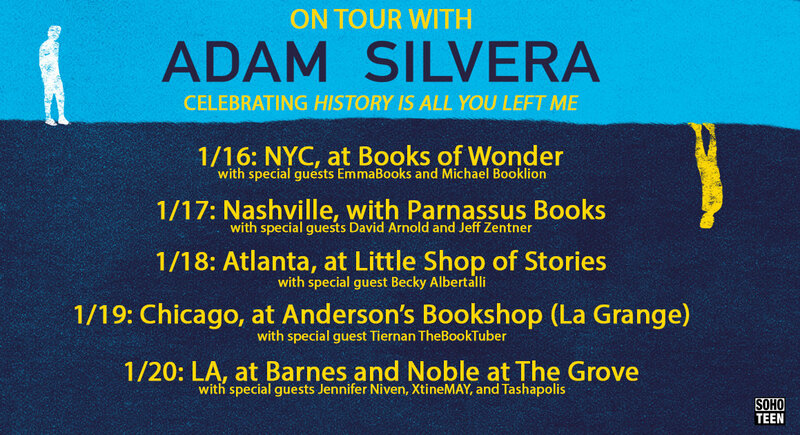 And....if you don't win do not worry because Adam, as awesome as he is, is going on tour. So have no fear Adam is here. Check the banner below to see if he is coming to a city near you. Oh wow this sounda emotional. I may have to stalk my library for this one, it sounds like the characters are fully realized and I like that past and present chapters gives you a different look at the characters!